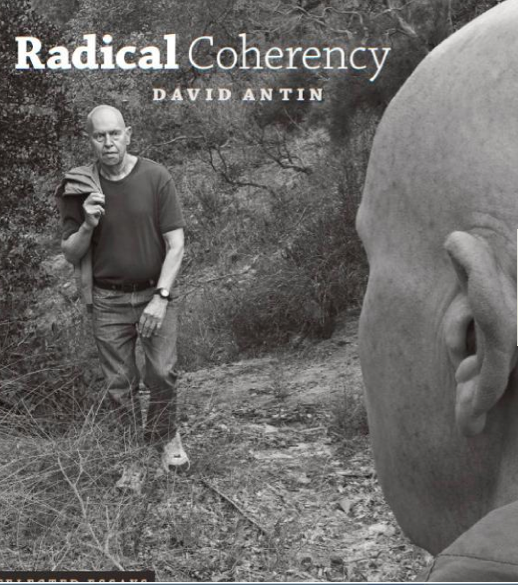 Fractures of the self: a review of "Radical Coherency"
One of the first things anyone approaching David Antin's marvelous new collection of essays on art and literature will notice is the striking image on the book's cover, a photograph that depicts David Antin, looking perhaps a bit more Buddha-like than in does in real-life, walking toward another image of himself, this from the back side of the face. There is something arresting about this image, even a bit eerie, but I made little of it when I first saw it, except to register that it represented an image of the author, symbolically speaking, of 1966 coming towards his current being. A few friends, however, found that image quite disturbing, one suggesting he had to keep the book face down on his coffee table. Perhaps it was just the oddity of having a photograph, which we associate with the real world, representing something that we know cannot truly happen, one aspect of self meeting up with the other.